Winner of a 2019 Love Your Community $500 mini-grant provided by the John and Mary Schumann Fund of the Community Foundation for Muskegon County, the Muskegon Lakeshore Figure Skating Club presents Get Up and Dance - a Figure Skating Show to Bring People Together. The grant contest challenged organizations to target areas not traditionally diverse, create proximity, try new things and bring people together. The Boys and Girls Club of the Muskegon Lakeshore members will skate alongside the Muskegon Lakeshore Figure Skating Club at L.C. Walker in the first effort to incorporate minority youth into figure skating in Muskegon. Watch local skaters ages 5-17 perform to dance music such as Conga (Miami Sound Machine), September (Earth Wind & Fire), Dancing Queen (ABBA) You Can't Stop the Beat (Ariana Grande), Uptown Funk (Bruno Mars), A Little Party Never Killed Nobody (Fergie), the Cha Cha Slide (DJ Casper) & more! The Muskegon Lakeshore Junior Figure Skating Club will also debut their first program. Special Guest skaters include JoJo Billings, Grace VanZanten and members of the Boys and Girls Club of the Muskegon Lakeshore! The skaters are from Muskegon, North Muskegon, Whitehall, Grand Haven, Spring Lake, Norton Shores, Fremont and Twin Lake. The coaches for the club are Skating Director Joshua Smith, Andrea Gardner, Suzanne Lararowitz, Trina Stojak, Anna Heger, Phoebe Whitbeck and ballet coach Olivia Ravell. A suggested donation of $5 helps cover show production costs and put money back into the community, but please join us regardless of ability to pay. Projects we hope to contribute to are buying new figure skates for our Learn to Skate at L.C. Walker program and raising scholarship for minority youth to take Learn to Skate at L.C. Walker classes. Money we raise goes right back into Muskegon! $1500 in proceeds from our last show were used to purchase high quality rental figure skates for our Learn to Skate at L.C. Walker program. Support our show and help us bring ALL kids to the ice at L.C. Walker! 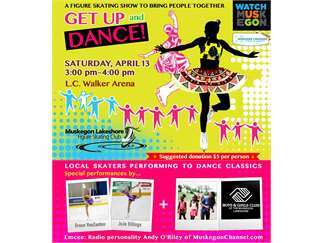 The show is from 3:00 - 4:00 on Saturday, April 13 at L.C.Walker Arena. Entry is by donation and is fun for the entire family. Muskegon radio personality Andy O'Riley of the MuskegonChannel and Positively Muskegon will emcee the event. The Muskegon Lakeshore Figure Skating Club is a volunteer, registered non-profit organization. The Club has its origins dating to 1960 and is open to membership to those interested in developing ice skating skills for figure skating competitions and recreational exhibitions. The Club serves the Muskegon, North Muskegon, Whitehall, Twin Lake, Freemont, Grand Haven, Spring Lake, West Olive and Norton Shores areas and skates on private ice at L.C. Walker Arena. A weekly Learn to Skate at L.C. Walker program is traditionally available during the school year for ages 3 through adult. Joshus Smith is the Skating Director and and coaches are available on private ice for individual instruction. The Muskegon Lakeshore Figure Skating Club is a member of the US Figure Skating Association and the Muskegon Lakeshore Chamber of Commerce. For more information, visit www.mlfsc.org or email MuskegonOnIce@gmail.com for Learn to Skate lesson information. 90s DANCE PARTY at Unruly Brewing | Muskegon at UNRULY BREWING CO.